Introduction: As gas prices continually reach new highs, recreational boats, especially those saltwater rigs with twin or triple outboard configurations, can easily use hundreds of dollars worth of fuel on one extended trip. For 2006, Honda Marine's BF225 has been modified to increase fuel efficiency 10% over previous models. Other new improvements make the engine easier to use for boaters and anglers. Impressions: While the Mercury Verado continues to grow in popularity fans of Honda outboards will be excited to know that the company is committed to improving what many already consider to be among the most refined outboards on the market. 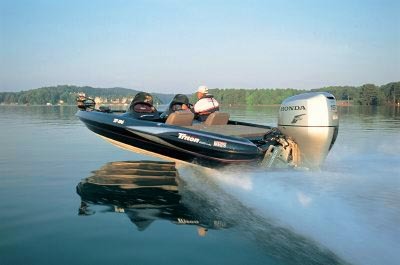 Known for their fuel efficiency and quiet operation even the most fuel efficient Honda outboards will still require their share of fuel on those multi day bass tournaments or offshore overnighters. It is for these dedicated anglers that Honda decided it was high time to implement some of their newest fuel saving enhancements on their biggest engines. In addition to employing a number of these proven features from their smaller BF150, the engineers at Honda also made some extra enhancements to further enrich performance. So what's new on the BF225? The BF225 now includes lean burn feedback control, which is also found on Honda Marine's BF150. With this feature, fuel economy is improved and power maximized throughout the entire acceleration range. In lean cruise mode, a linear air-fuel sensor and engine command system automatically adjust the air-fuel mix according to speed and load. 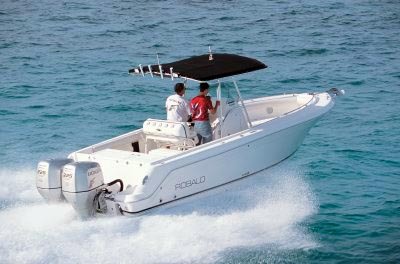 "With the new BF225, boaters and anglers get superior performance and fuel efficiency. It shows how Honda technology keeps people on the water and having fun without worrying about fuel costs," said marketing manager Robin Senger. Honda technology has improved shifting on the 2006 BF225. Engineers developed a new shift mechanism and redesigned the heavy-duty gear profile to make Neutral easier to find. With the addition of a new throttle cam, low-speed running is enhanced, and operators can fine-tune trolling in 100 rpm increments between the 650 rpm to 1,200 rpm range. An anti splash shield added to the engine's midsection reduces splash and spray when boats, especially offshore boats, during take off. Based on Honda's reliable automobile engine design, the large-displacement V-6 engine utilizes Variable Valve Timing and Lift Electronic Control (VTEC) to deliver a unique blend of power, torque and efficiency at any speed. This is an adaptation of the very same technology that makes Honda's high revving NSX and S2000 sports cars so responsive and entertaining to drive. "Performance with efficiency is what VTEC is all about," states Senger. Cleaner burning & Warranty: As with all of Honda Marine's environmentally friendly outboards, the BF225 exceeds 2006 EPA emissions standards and complies with the California Air Resource Board (CARB) 3-Star rating. All Honda Marine outboard engines have a limited, 3-year, nondeclining warranty that provides anglers with the same top-to-bottom coverage from the first day to the last. Pricing: Honda Marine's BF225 comes in 20-inch, 25-inch and 30-inch shaft sizes with a suggested retail price beginning at $18,740. This puts the new Honda BF225 right in the same price range as the competitor offerings. 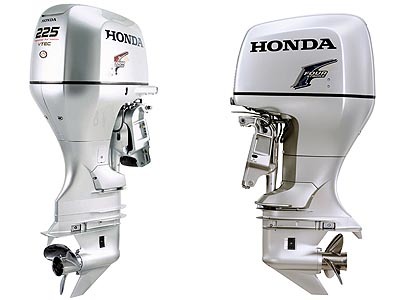 Conclusion: Many 4-Stroke outboard fans turn to the Honda to power their fishing machines for a number of reasons, the most compelling of which is the company's use of advanced technology, level of refinement, quiet operation, and fuel efficiency. Honda was the first manufacturer to really tout the advantages of 4-strokes, stressing that no intake and exhaust ports in 4-stroke cylinders and pistons allow the engines to run at much tighter tolerances and for an extended lifespan. Many anglers have switched to 4-strokes because of environmental regulations and fuel efficiency, and the new and improved high power Honda BF225 appears to be an excellent choice for anglers that necessitate plenty of power and still wish to diminish those frowns every time it is time to pay a visit to the gas pump.